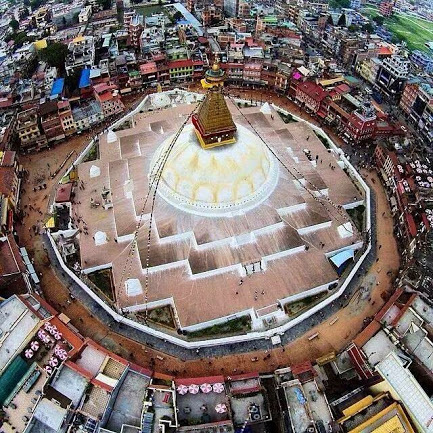 Update: The Boudhanath Stupa did not suffer any serious damage from the earthquakes of early 2015. However, the part of the stupa above the dome was later taken apart because of a major crack. See the end of the post for more information and links to videos. 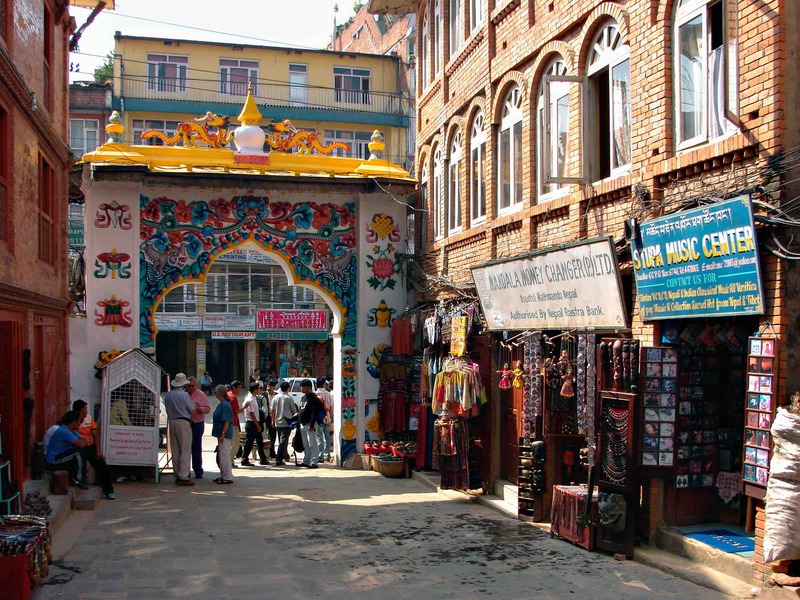 A short tuk-tuk ride from Thamel – the “tourist ghetto” of Kathmandu – and we were at the ticket booth and the short street leading north to the Great Stupa at Boudhanath (also spelled Bodhnath). There is one main physical focus – The Great Chorten or Stupa – in this once small village called Boudha to the east of Kathmandu . Hundreds of years ago it gained importance as a stopping point on the great yak caravan route from this valley to Lhasa, a shrine to leave offerings or petitions at journey’s start or end. 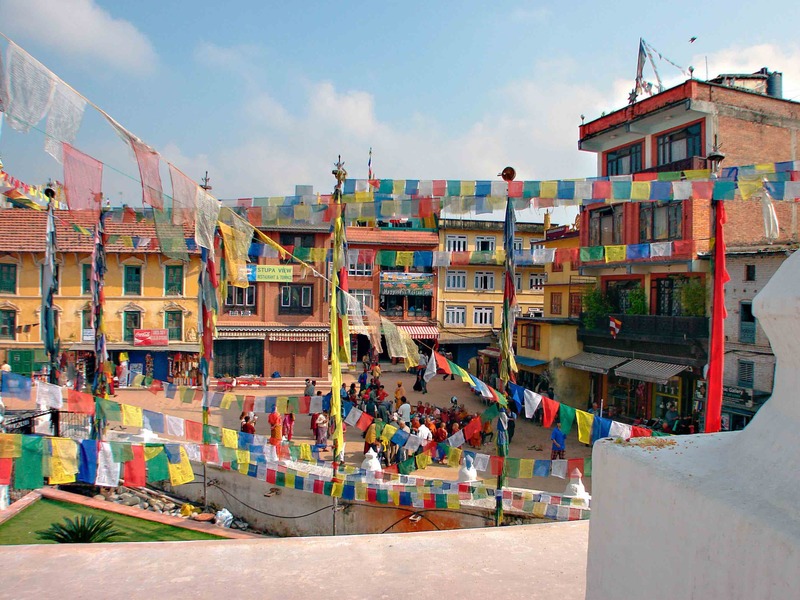 These days, however, it is the heart of the growing Tibetan Buddhist community in the Kathmandu valley and has attracted all around it both refugees who fled their homeland when the Chinese invaded in 1959 and the Sherpas who have branched out from their traditional heartland in the Khumbu. We spent a couple of memorable mornings at Boudhanath, walking around and taking in the stupa from various vantage points. 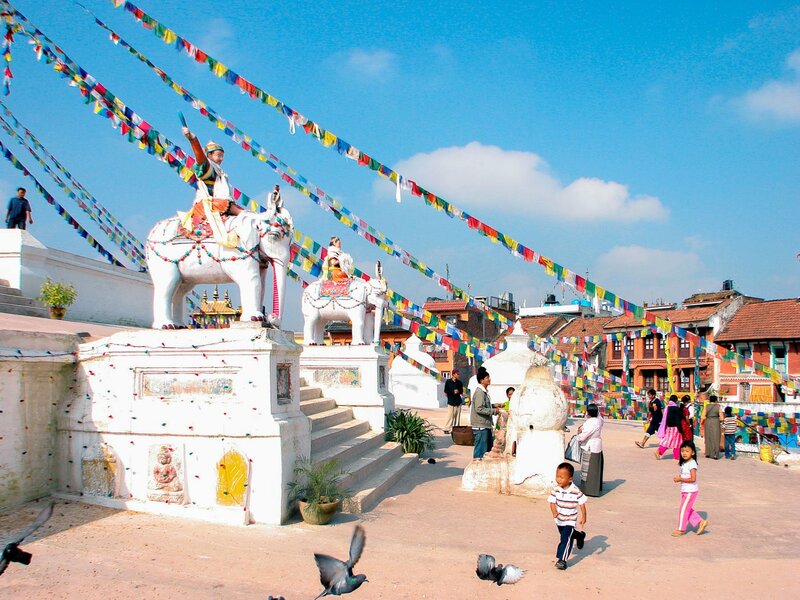 All around the Stupa are multi-storey homes, guesthouses, gompas, meditation centers, thangka shops, cafés and restaurants…it is teeming with life. 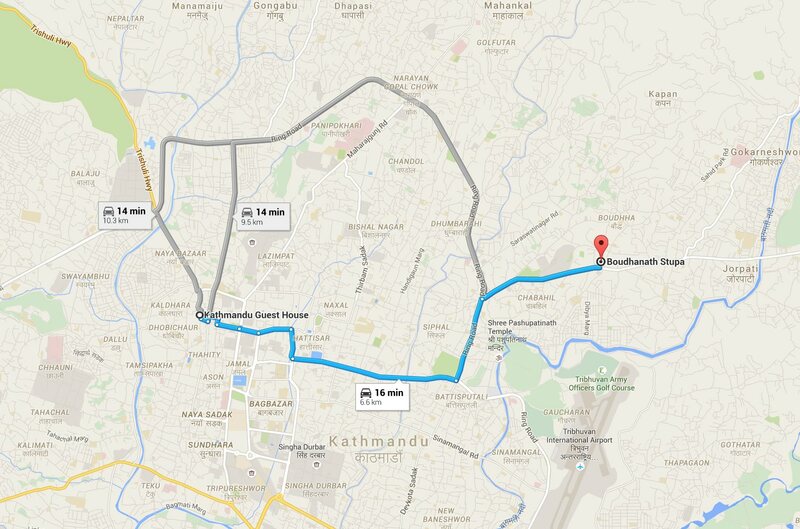 In fact, on my next visit to Kathmandu, I will make Boudhanath my base camp during the time I spend in the valley. Being there early in the morning or later at night after the tourist/pilgrim ratio changes would make the experience even more special. From the main road you walk through the archway and down the narrow street pictured above, first stopping at the ticket booth where you pay a nominal entrance fee. You walk into a sea of Tibetan prayer flags, all imprinted with mantras whose positive energy the wind is said to blow into the world. 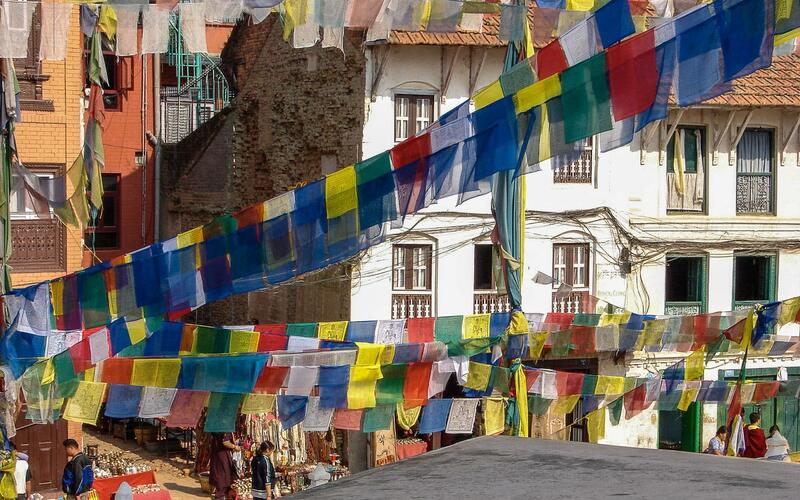 All around the stupa, prayer wheels spin, turned by pilgrims who walk by in a clockwise direction. 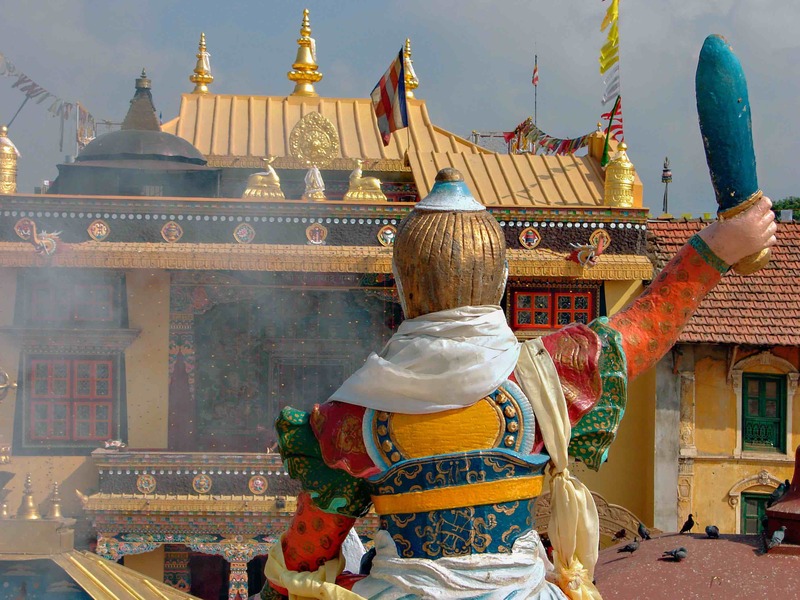 Symbols of Tibetan Buddhism are everywhere; so too are signs of a living faith exhibited by the total gamut of pilgrims – from well-heeled city dwellers to rough-clad peasants to young and old monks in their maroon, yellow, and red robes. We made our way to buildings on the front (i.e. north) side of the Stupa. A fantastic view can be had from the fourth-floor terrace of the Stupa View Cafe and Restaurant. 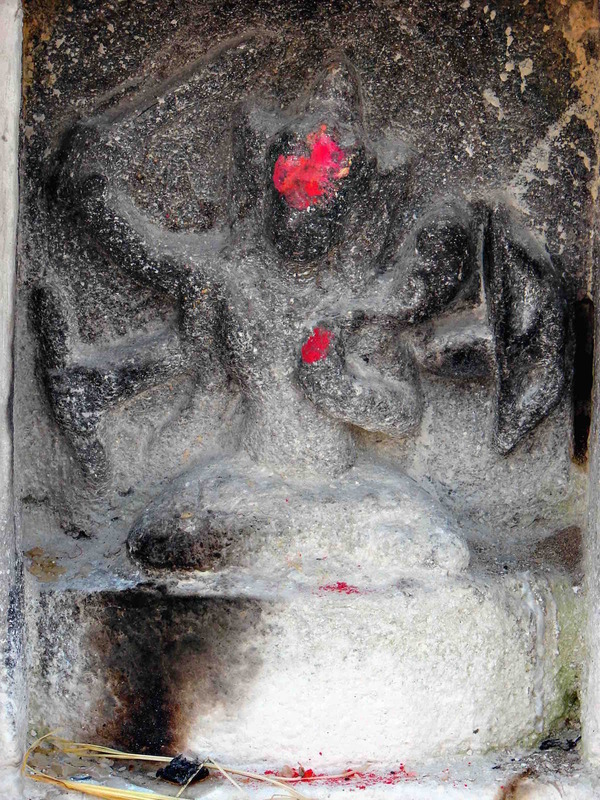 In the pic below you can see the top of the shrine dedicated to Ajima (aka Hariti), the demoness of smallpox. It seems that an encounter with the Buddha convinced her that infecting children with the disease was not a Buddhist thing to do (the Buddha had converted her) so she agreed to stop – with one proviso. She would stay within the confines of the shrine as long as she received offerings and prayers there. And so they come, kneeling between the two lion figures on the outside and looking into the shrine at the Ajima statue with their petitions and prayers. Behind the shrine are the steps leading up to the three levels of platform to the very base of the stupa. The steps take you past the two riders on elephants. 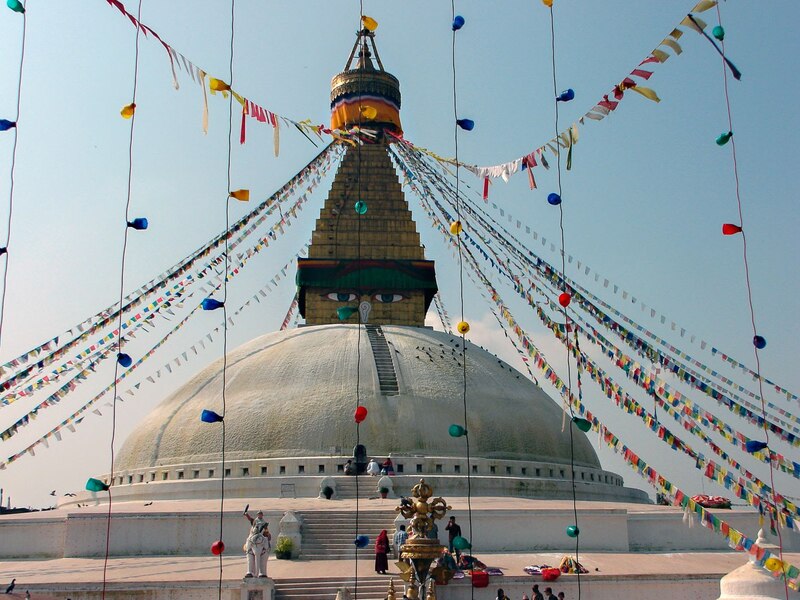 The Stupa is about 40 meters high and 100 meters in diameter. 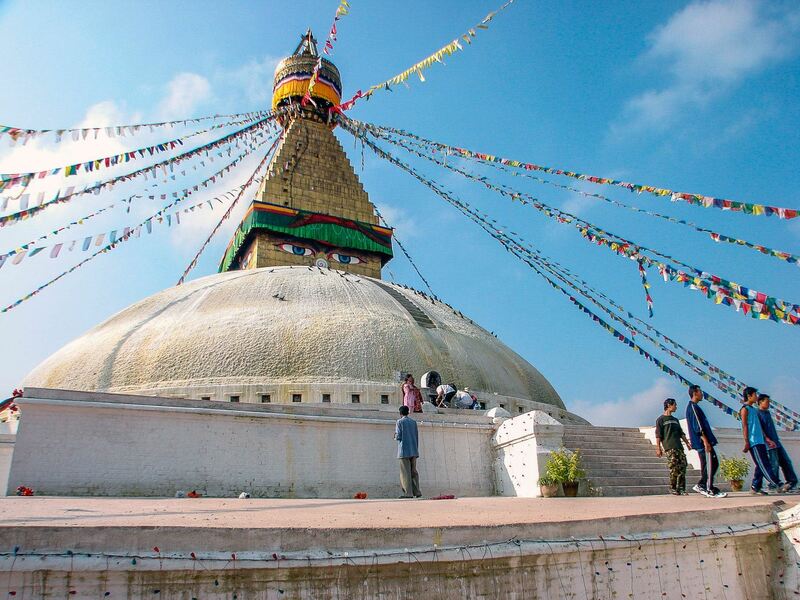 While it may be Nepal’s largest, the current Lonely Planet guide is wrong to call it Asia’s “largest stupa”. Sri Lanka’s Anuradhapura, for example, has two stupas which are much higher – the Jetavanaramaya at 122 meters and the Ruwanwelisaya at 92 – and with larger diameters. Beyond all the measurements, however, the scene around the stupa at Boudhanath was definitely much more atmospheric and vibrant than what I found with the Sri Lankan stupas (dagobas in Sinhala) since they are in an archaeological zone away from the modern city. Each of the five flag colours signifies a different essential element, with yellow representing earth, green water, red fire, white air, and blue space. A walk around the two levels of the stupa platform provides a different perspective. In the photo above I am looking back at the Stupa View Restaurant, whose sign you can see if you zoom in on the image! Like the Swayambhu Stupa, this one has all the classic elements – the dome, the square box (the harmika) on top, the 13 receding steps of the spire leading up to the elaborate umbrella. 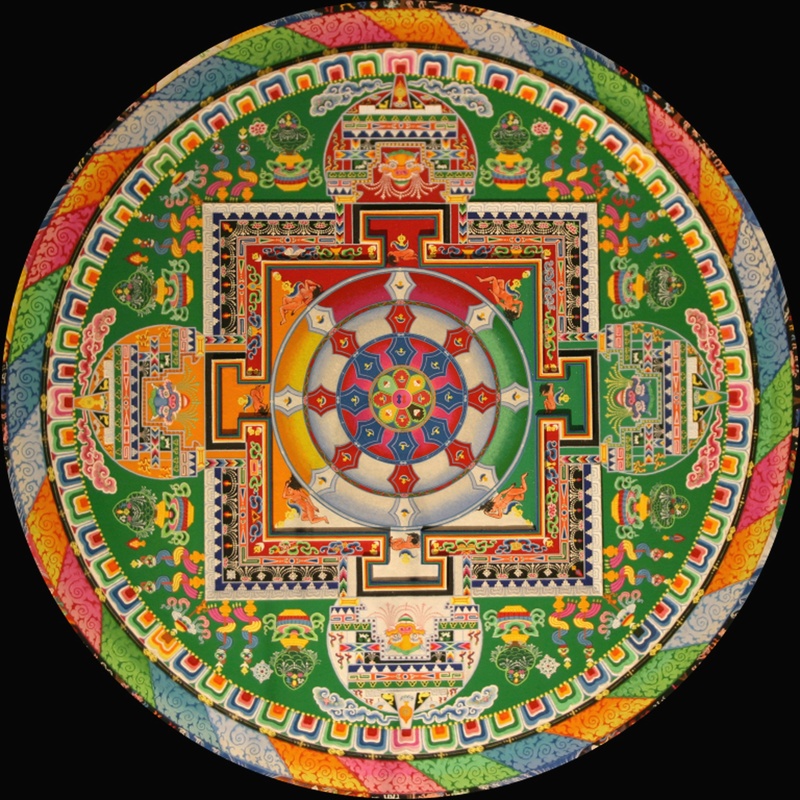 The different elements also correspond to the symbolism of the prayer flags with the base being earth, the dome water, the square box fire, the spire air, and the umbrella space. Having grown up as a Roman Catholic I can appreciate how Tibetan Buddhists revel in their highly visual approach to faith! 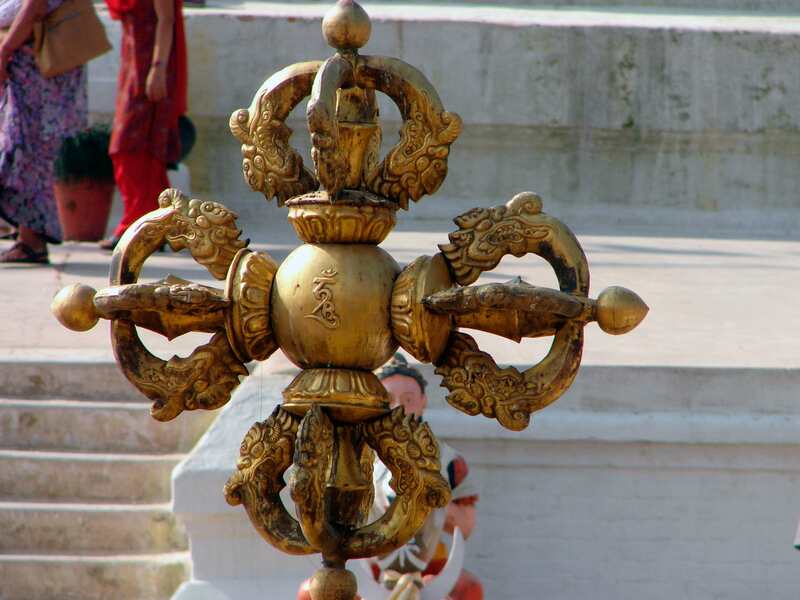 On the four sides of the square, looking out into the four cardinal directions, are the Buddha eyes. 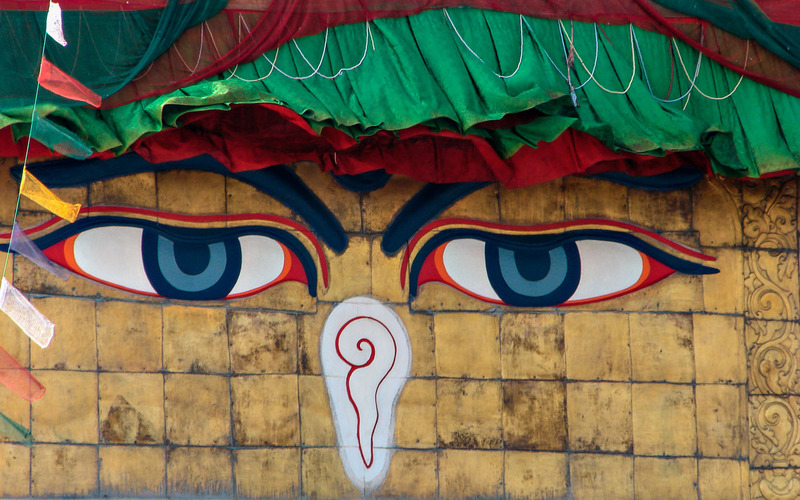 Eyebrow above and what some take to be a nose – it is actually the Newari symbol for the number 1 – and you have the iconic Buddha face. The stupa as a religious structure began as a relic mound supposedly containing some bone remains of the Buddha salvaged after his cremation. Some stupas, especially those in Myanmar, claim to have strands of hair which the Buddha gave to Burmese travellers while he was alive. 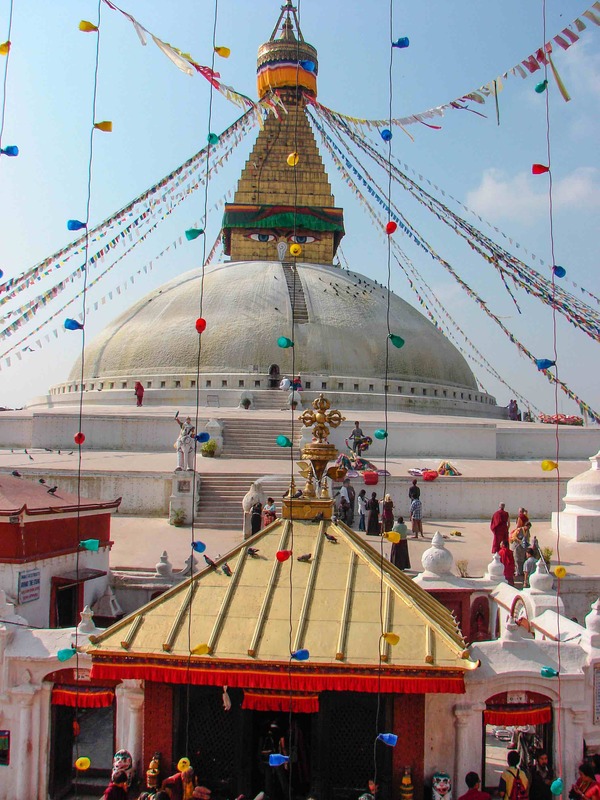 The Boudhanath stupa, some believe, holds the Buddha’s collar bone but the most fantastic story is this one retold by Keith Dowman in his The Power Places Of the Kathmandu Valley. When the stupa was consecrated 100 million Buddhas dissolved into it, and it has the glory of being filled with their sacred relics. Whatever prayer is offered to it is fulfilled, and if you meditate upon your personal deity here, at the time of your death you will be reborn in Sukhavati. 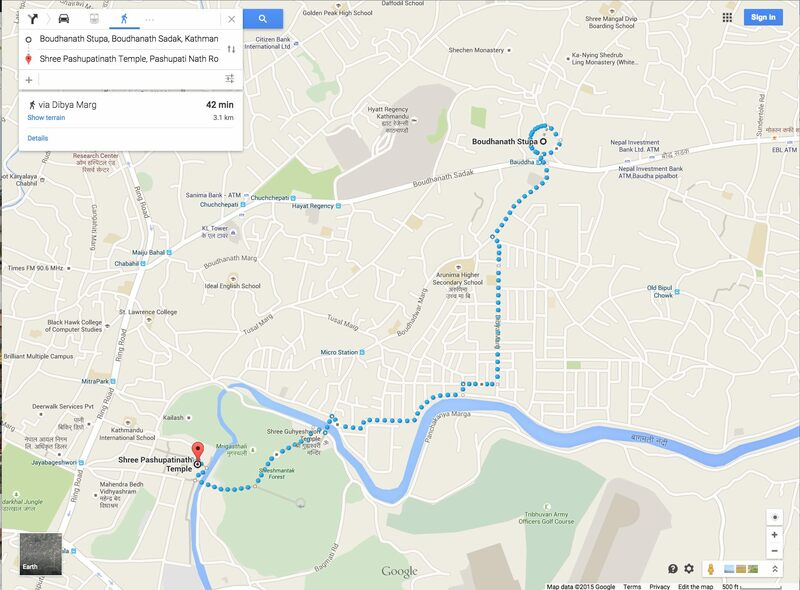 After our visit to the Great Stupa, we walked towards the Bagmati River and then headed towards the Hindu temple complex there. 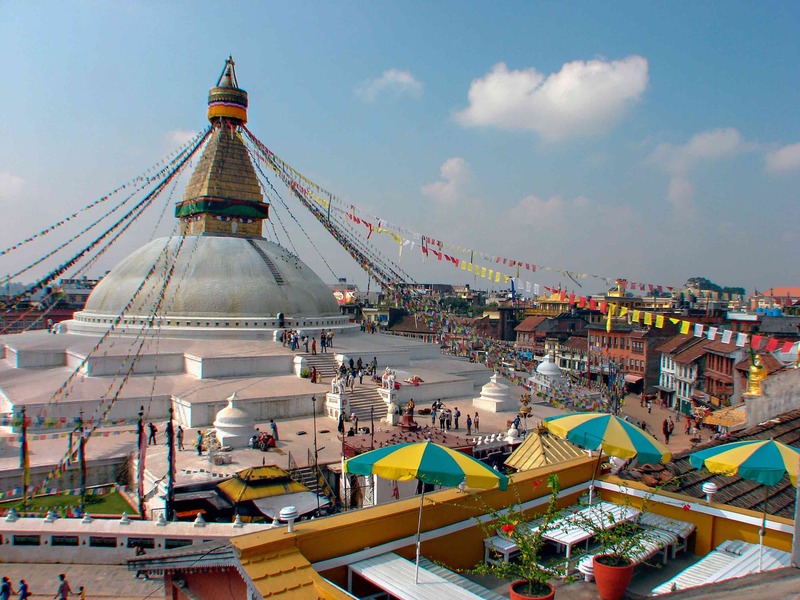 If Boudhanath is the heart of Tibetan Buddhism in the Kathmandu Valley, then Pashupatinath plays the same role for Hindus. 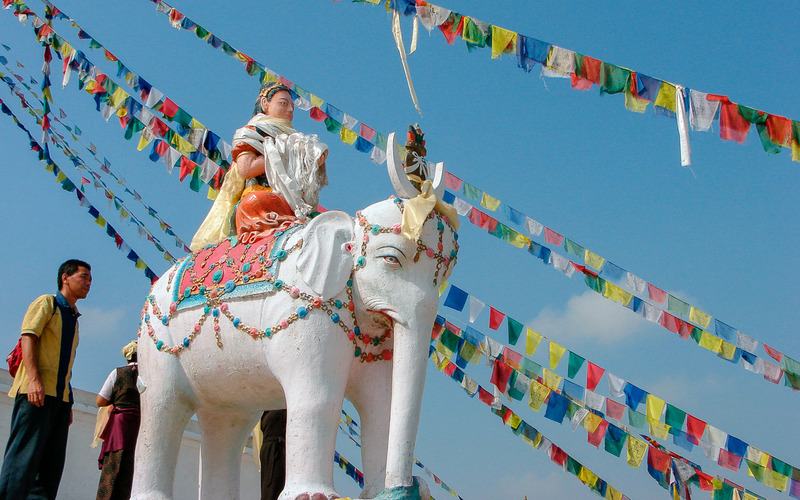 Click here for a report on the state of the UNESCO sites in the Kathmandu Valley as of May 11th and 12th. You can find the blogger’s profile here. 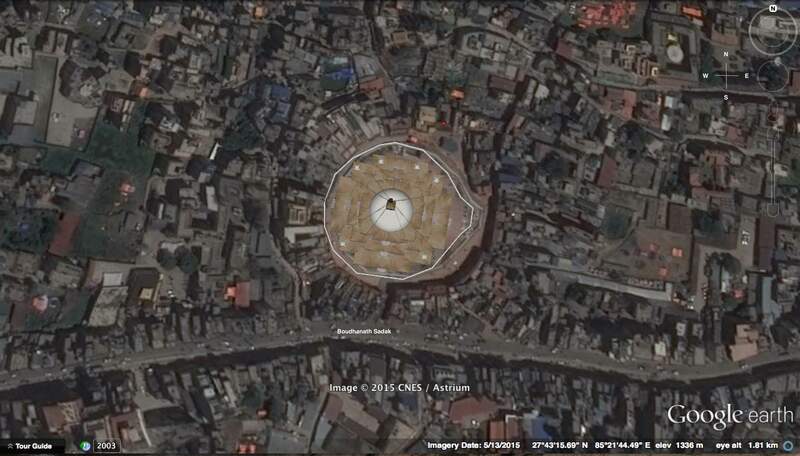 As the above blog mentions, the stupa itself escaped any serious damage. He reported some bricks having been dislodged from the spire. At the base, one of the mini-stupas has crumbled apart. The site – along with Pashupatinath – was been declared safe to visit on May 26, according to a Nepali Times news article. Click here. So is this Youtube video from mid-November of 2015. 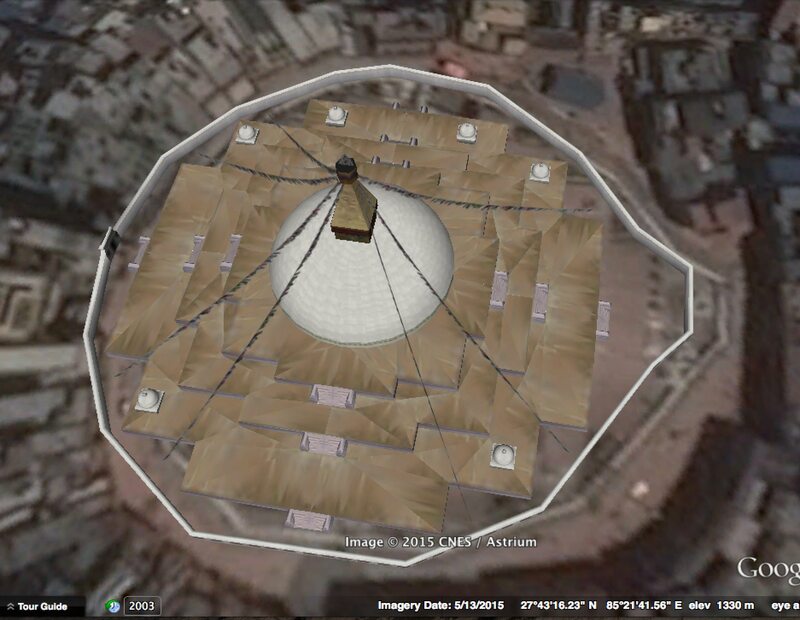 It shows the stupa without the box and the spire on top of the dome. On the platform you can see all the bricks as workers reconstruct it. Click here to access. This entry was posted in Nepal and tagged Ajima shrine smallpox, Bodhanath prayer flags, Bodhnath satellite image, Boudhanath earthquake damage, Boudhanath stupa size, Buddha eyes and nose, Buddha stupa relics, stupa mandala, stupa parts, stupa saffron color, Thamel to Boudhanath. Bookmark the permalink.